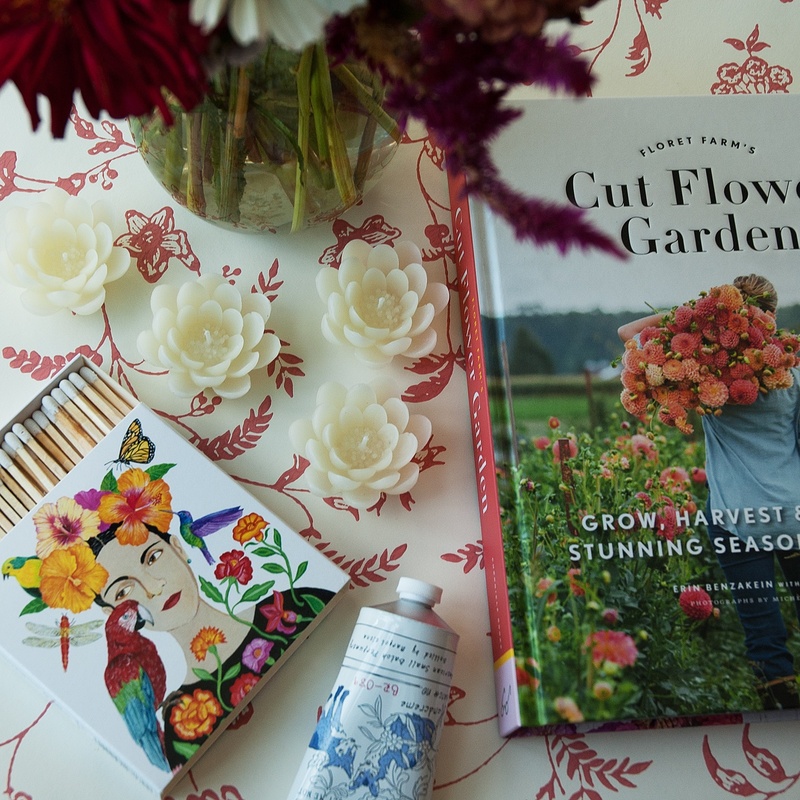 Floret Farms Cut Flower Garden Book: Inspired by her grandmother’s flower garden, Erin Benzakein has turned her love of flowers into a life surrounded by blooms. “The underlying philosophy of this book is that using local blooms and other materials when they’re in season, at their most abundant, will give you the most luscious, beautiful bouquets.” Let Erin help you create your own seasonal garden in the backyard. Perfect Posy Bud Vase: Hand blown in Poland, our perfectly shaped mini posy vase will host your most precious cuts from the garden. The slightly tapered neck and flared opening will allow your flowers to gracefully support their stems. Measures 4.5-Inches. White Lotus Floating Candles: Float these detailed and elegant candles in a bowl or vase to create a subtle ambient table decoration. Also perfect for a koi pond or romantic bath. Set of 4, each candle measures 2.25 x 1.25 and will burn up to 3 hours. Forget Me Knot Hand Cream: One of the best pick me ups for any day, this nourishing hand cream has a delicate floral scent and rich hand cream, perfect for dry hands from the garden. With floral notes of Osmanthus and white orchid, the hand cream contains generous amounts of cocoa and shea butter for deep hydration. 2.65 oz. La Dolorosa Matches: We find it difficult to pass up a well-made box of wooden matches, particularly this fanciful and detailed box. Artist RonTanoviz has created a colorful interpretation of La Dolorosa (lady of sorrow). Part of a series of floral women, this may be our favorite, because of the bold color. Our square box set contains 60 matches.